LEDs sip less power, last decades and fit neatly into delicate industrial goods, but will they ever be as beautiful as incandescent lights? “Most LEDs don’t meet people’s expectations for the kind of light they want in a home or office,” says Stathis: they are directional, glare-ridden, harsh and bluish, and using diffusers or colored gels kills the watts-to-lumens ratio that makes them so efficient. For their Trapeze lamp, Stathis and JOBY (makers of that famously clever flexible tripod) designed what they call a “flat panel light engine” to serve as the lamp-head. Encased in a polycarbonate lens with a specially in-molded pattern, the light engine efficiently spreads the LED cast evenly across the surface, filters for a natural hue and diffuses the head of 102 diodes that JOBY says will last about 25 years before losing any brightness. Eventually, say the partners, LED lights will be extremely common in homes and offices, and the hope is that the Trapeze light is the first of a generation of low-power lamps and bulbs that actually exceeds consumers’ expectations for old-fashioned bulb lights. “If you design from the light engine outward, we believe you can build something superior, says Forrest Baringer-Jones, CEO of JOBY. They didn’t stop at the head, however; the Trapeze also uses a series of spherical aluminum joints to make its arm position malleable. 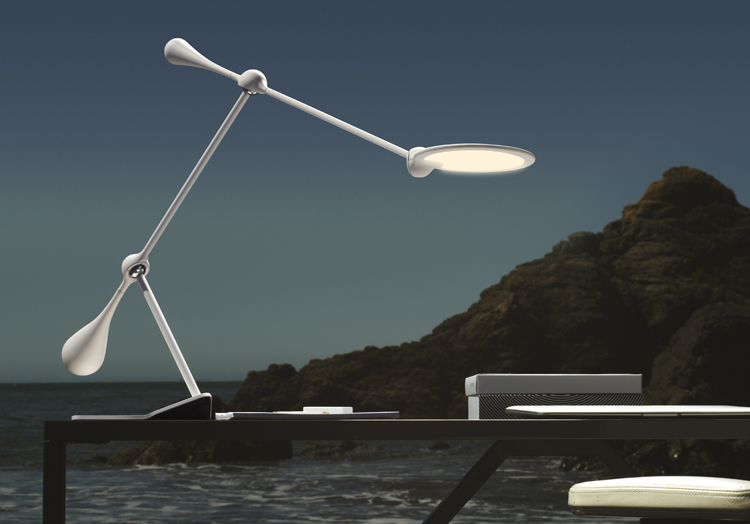 If the notion of a LED-lit future seduces your conscience or wallet, you can buy the Trapeze in two sizes. They are priced $300 and $350 on JOBY.com, and begin shipping in August.